Each ABCCats cat toy is made by hand and designed with your cat in mind. 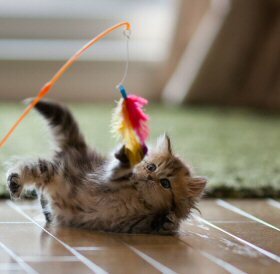 Our toys are constructed from the finest materials and handcrafted to add fun and exercise to your cat's everyday routine. ABCCats teasers and fly toys have been sold at cat shows around the country for twenty years and we ship to buyers worldwide. Cats are happier and healthier when they are encouraged to run and play. With ABCCats cat toys your cat will jump, move and pounce his way into becoming the happier, healthier cat he was the day you brought him home. ABCCats cat toys... bringing out the kitten in your cat. Please enjoy browsing our website and if you are a retailer wishing to carry our toys please contact us at catsunlimited@sbcglobal.net.